Fighting in the trenches of WW1 was a living hell but on April 22, 1915 it became even worse for thousands of French troops engaged in the Second Battle of Ypres in Western Belgium. Peering out across no-man's land they notice a low hanging greenish-yellow cloud heading directly for them. What they are seeing is the first use of poison gas on the Western Front, unleashed on them by the German enemy, it's going to kill thousands of these poor French warriors. Poison gas is just one of the many new weapons developed during WW1. On this page we list facts about many of the weapons invented and used during World War One. On this page you will also find links to interesting information about many of these deadly weapons. Hopefully both kids and adults will find this information useful. Click here for a great selection of Amazon.com books about WW1 weapons. When discussing World War One weapon facts it is important to mention that most of the new weapons developed and improvements on existing weapons during this war were designed for breaking the stalemate of trench warfare that the war turned into. This was a situation where the opposing lines were separated by open and often short distances, called no-man's land that neither side could cross without being wiped out by the other side. For example the tank was developed for safely crossing no-man's land and then attacking the enemy. Whereas poison gas and flamethrowers were developed to wipe out or weaken the enemy so that a successful attack across the open area could be accomplished. Heavy Artillery - Advances in artillery weapons during WW1 made heavy artillery the most effective and deadly weapon utilized during the Great War. 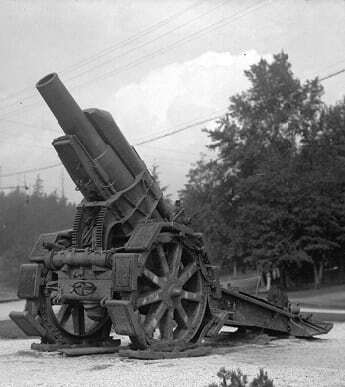 Both sides made artillery that was more accurate, delivered bigger more powerful shells, and was easier to handle than had existed prior to the war. Rifles - The most crucial and reliable weapon for a WW1 soldier was his rifle. Almost every soldier from both sides carried a rifle. British soldiers were issued the Lee-Enfield 303, German soldiers were issued the 7.92mm Mauser, the French used the Lebel 8 mm, and the Americans used the Springfield or the M1917 (American Enfield). Rifles were also used effectively by snipers on both sides. Machine-guns - Able to fire up to 500 rounds per minute the machine gun was an effective weapon. Although effective they were heavy, difficult to move around, and required a flat service and it is perhaps for those reasons they were not greatly utilized during the war. Tanks - This weapon made its debut at the Battle of Flers-Courcelette on September 15th 1916 when the British launched 32 of them towards the Germans across no man's land. Throughout the war this weapons lack of speed, immobility, and susceptibility to break downs generally made it ineffective. Flame-throwers - This horrific new weapon of WW1 was introduced by the German army. The weapon was used to spray burning oil (or gasoline) into enemy trenches from a tank or backpack. Due to the short range and unreliability of the flame-thrower it never became a very effective weapon. Mortars - This weapon became increasingly more important as WW1 turned into trench warfare. It enabled soldiers to lob small bombs into enemy trenches and other positions from a safe distance. The targets were often snipers and machine gun positions.